It’s a simple fact: kids love animal encounters. On your private Peru family trip, include one of these unique animal encounters into your personalized Peru itinerary. From feeding baby manatees to visiting an animal orphanage in the Amazon, you and the kids will find plenty of wildlife to ogle at on your custom Peru family vacation. Looking for a sure-fire way to get your kids smiling during your Peru family trip? Bring them face to face with animals! 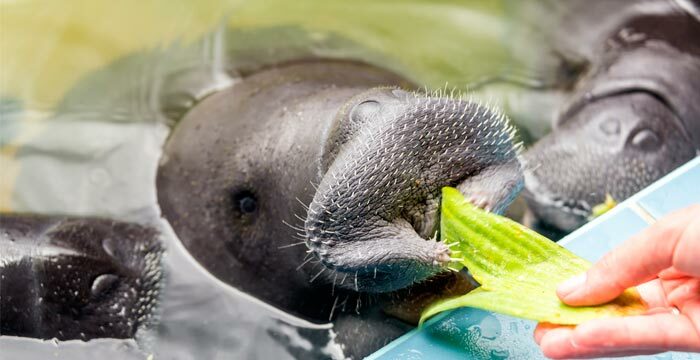 Kuoda can arrange several animal-related activities during your Peru family trip, including a visit to the Manatee Rescue Centre, located just half an hour from downtown Iquitos by moto-taxi. The center is home to adorable injured and orphaned baby manatees (as well as other animals) who are kept here for rehabilitation until they can be released into the wild. Kids will go crazy for these gentle aquatic mammals and you’ll even get the chance to feed water plants to some of the playful babies. An English-speaking guide will also provide educational information, explaining in detail what the center does and teaching the younger members of the family about the problems created when people capture endangered species to keep as pets. After touring the center, stroll around the well-kept grounds, where the shady trees and ponds provide respite from the intense heat of the jungle. In all our years of organizing family tours of the Amazon, we’ve begun to notice a pattern: children love animal encounters. 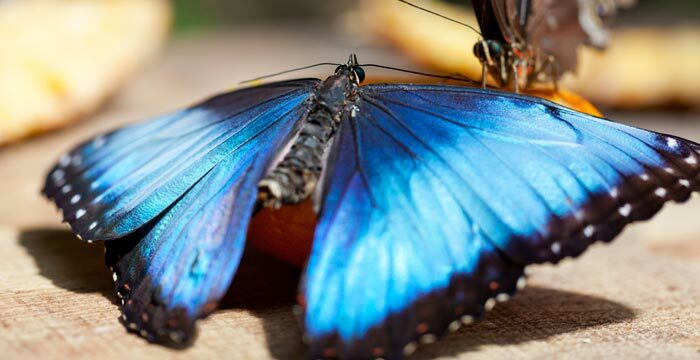 One of the best places to get up close with critters and creatures is the Pilpintuwasi Butterfly Farm. Begun by Gudrun Sperrer in 2004, the Pilpintuwasi Butterfly Farm makes a wonderful day out during a personalized family tour of Peru. Working with the ecological police in Iquitos, Gudrun rescues animals that were illegally held in captivity. The animals have the run of things here, and include species such as bold red-faced huacari monkeys, jaguars, ocelots and anteaters. Then there are the butterflies, an astonishing variety of which flutter about the shelter. English-speaking guides will educate budding nature enthusiasts on the butterfly life cycle, from caterpillar to chrysalises to fully-grown adult butterfly. Getting to the farm is an adventure in itself, and one that kids will no doubt appreciate: you’ll have to take a 20-minute boat ride from Bellavista-Nanay port in Iquitos followed by a 15-minute walk. During the rainy season, the boat goes all the way to the center. High rubber boots are a must as the path can be muddy, though we’re confident a bit of mud will only add to the appeal for miniature adventurers. Call Kuoda today to arrange for a tour of the Pilpintuwasi Butterfly Farm during your Peru family trip. Any aspiring equestrians among your brood? If so, they’ll love attending the Peruvian Paso Horse Festival in Pachacamac, located just under an hour’s drive south of Lima. The horses celebrated during this festival aren’t just any old kind, but a very special type carefully designed by breeding Berber and Spanish steeds. The result is the unique Peruvian paso, whose distinctive lateral high-stepping gate makes for a seriously smooth ride on the saddle. 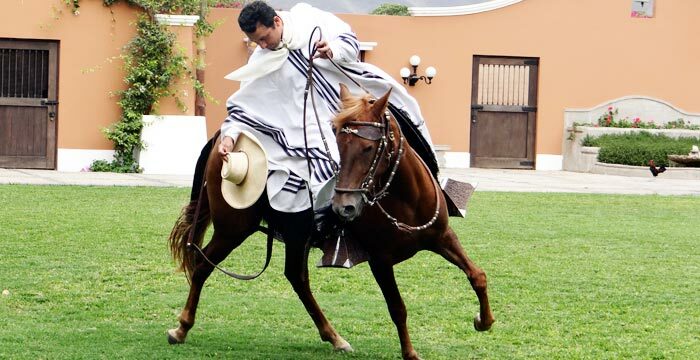 Attend this weeklong event during your Peru family travel adventure and you’ll be treated to horse-related competitions during the day followed by celebratory nights spent eating delicious Peruvian food and listening to traditional Creole Music. The festivities come to a climax on the final day when the Marinera (Peru’s National Dance) contest is held. Kids and adults alike will be agog as they watch a male dancer on horseback perform alongside the female dancer on foot. Like what you hear? Get in touch with Kuoda, who can make arrangements for you and your family to attend the festival during your private Peru vacation. The festival takes place every April and admission is free with the exception of the closing ceremonies on the final day. Children and museums don’t always make a perfect pairing, but Awana Kancha isn’t a museum in the traditional sense. Rather, it’s a textile-producing center set in a community where daily life revolves around weaving. Kids can watch as locals wearing traditional dress perform demonstrations showing every step of the weaving process including shearing the animal, spinning the wool, dyeing the fabric using plants and insects, and weaving the textile on back-strap looms. 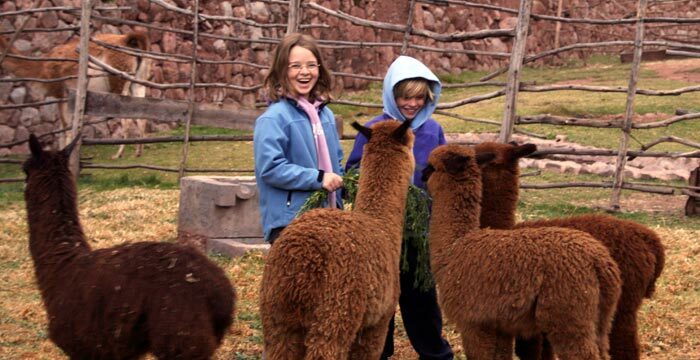 Another child-oriented treat follows as kids get to meet live alpacas, llamas, guanacos and vicuñas. They’ll learn how to identify which camelid is which, find out how they manage to survive life on the high Andean plains and even pet and feed them. If any of the super-soft textiles catch your eye, head to the gift shop where you’ll find items made from the various fabrics. Admission to Awana Kancha is free though donations are very much appreciated. Have Kuoda plan your visit here; it’s a particularly convenient stop-off for families who might be traveling to the Sacred Valley at some point during their customized tour of Peru. If there is one place on the planet which has the ability to simultaneously delight kids and make kids out of adults, it’s surely the Amazon jungle. Whether you are four or 74, the incredible biodiversity of this region is relentlessly thrilling. During a family-focused tour of the Amazon, you can take your pick from a plethora of nature and animal-centric activities: boat trips to see pink river dolphins, after-dark excursions where you’ll encounter the shining eyes of the black caiman and piranha fishing expeditions to name a few. The potential for unforgettable animal sightings is high: look for monkeys, jaguars and ocelots as well as all kinds of fabulously bright rainforest birds, including parrots and macaws. 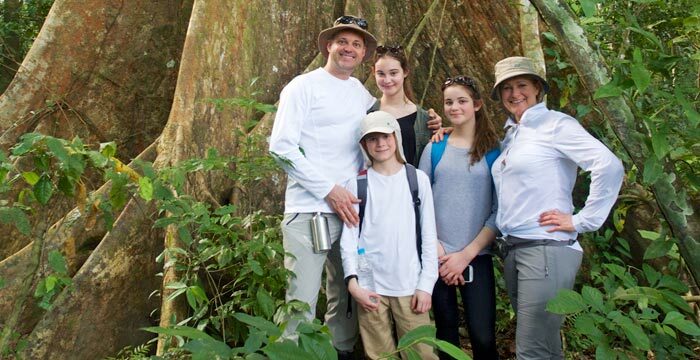 Include an excursion to Iquitos, Tarapoto or Puerto Maldonado during your Peru family trip and open your and your children’s eyes to the incredible wealth of species that thrive here in the jungle. And with Kuoda here to make all the necessary jungle arrangements, all you need do is bring your intrepid little explorers along for the ride. A trip to the Ballestas Islands promises an animal extravaganza that will have the whole family on the edge of their seat! This rocky archipelago can be reached by speedboat. The islands themselves teem with wildlife, including jovial sea lions and fur seals, South America’s only endemic penguin species (Humboldt penguins) and thousands upon thousands of sea birds, who together emit an astoundingly loud and cacophonous chorus of chirps. From the wildlife-overrun Ballestas Islands, it’s just a two-hour speedboat ride to the Paracas National Reserve, a protected marine area that shelters species including American flamingoes, blue-footed boobies, sea turtles, seals and sea lions. Continue your Peru family trip here as you see the famous Candelabra geoglyph, an ancient etching whose meaning and purpose remains a mystery to this very day. 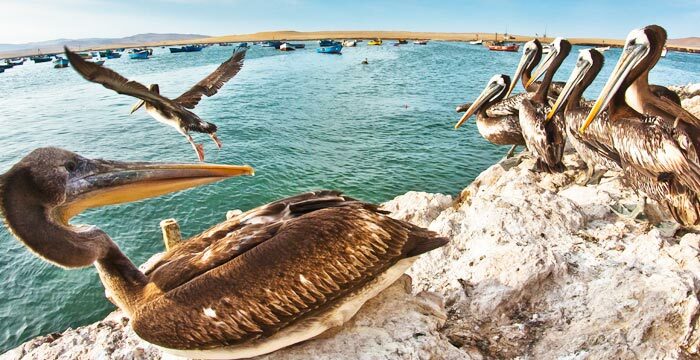 Whether it’s speeding across the waves or photographing lounging sea lions on the shore, wildlife-loving families will find plenty to thrill during a private tour of Paracas.